Ever want to compare the sizes of 10 different animals in the United States? Here’s your chance! This isn’t a definitive list of the top ten largest animals found in the US, but it is a non-definitive list of ten animals, sorted by the typical sizes of the males. Where to Find Them: Cougars once roamed all across the USA, but were nearly wiped out by hunters. Sightings throughout the midwest and northeast are rare, and the Florida panther is critically endangered. Fun Facts: Because they can be found all across the US, cougars also go by the names panther, mountain lion, puma, and catamount, depending on the region. Compared to the rest of the list, cougars aren’t that big, but they are huge compared to your pet tabby. Fun Facts: To attract female elks, males (bulls) will “bugle”, a very high-pitched noise. The females (cows) are attracted to the loudest, most frequent bugles. Fun Facts: Due to over-hunting, loss of habitat from human development and climate changing, and poaching, there are only around 1,000 crocodiles in Florida. Oops, that’s not a fun fact. Fun Facts: The Kodiak bear is the largest subspecies of brown bears. One Kodiak named Clyde lived in captivity in the Dakota Zoo in Bismarck, ND, and grew to nearly 2,400 pounds. Fun Facts: Polar bears are the largest carnivorous land mammals on the planet. Fun Facts: The moose is the largest within the deer family. Their antlers (or paddles) can grow six feet across. Where to Find Them: Largest populations can be found in Yellowstone National Park and Wood Buffalo National Park. 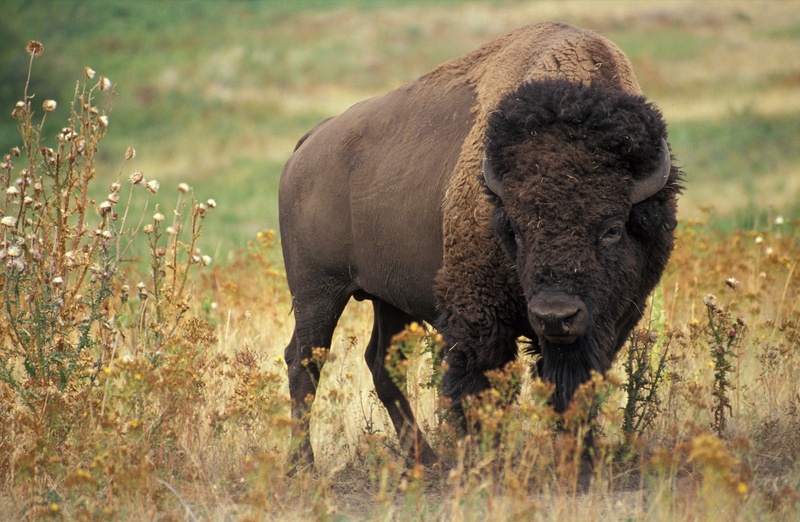 Fun Facts: Almost 30 million wild bison used to roam North America, but due to unhindered hunting, only around 500,000 live in North America today. Fun Facts: Both bulls and cows grow tusks, and social status is determined by the size of the tusk. Bigger tusks = more respect. Fun Facts: The southern elephant seals are typically nearly twice the size of these already gigantic seals. Where to Find Them: During the summer, you’ll have your best chance seeing a humpback in the US if you’re a the Gulf of Maine or Gulf of Alaska. In the winter, head down south toward Hawai’i. Fun Facts: Humpback whales are HUGE (about the size of a school bus), but they are still only about half the size of blue whales.